AllegroMedical.com presents The Ventura 3 Wheel Scooter. The Drive Medical Ventura 3 scooter offers a great combination of performance, size, comfort and styling, making it the perfect mobility option if you're looking for the "next step up" from a compact/transportable scooter which includes a 350 lb. weight capacity. The Ventura 3 performs well both indoors and outdoors and is available in two models-Standard and Deluxe (DLX)-so you can choose the scooter with the features that are right for you. The Standard model features 20AH batteries, a folding "stadium-style" seat and a headlight. 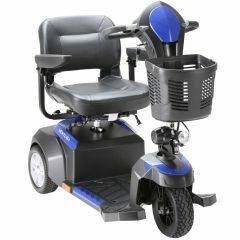 The Deluxe model features 36AH batteries for greater range, a full safety package which includes rear view mirrors, additional lighting, and the choice of an 18" or 20" wide Captain's Seat. You can even customize the Ventura's color with the red and blue interchangeable panels. All Ventura models have four different seat height adjustments and automobile-style seat positioning which slides forward or backward providing even more comfort. The padded armrests are height, width and angle adjustable. Controlling the Ventura cannot be easier thanks to the adjustable angle tiller that allows you to place the controls in the most comfortable position and the ergonomic delta handles which make it easier for those with limited strength or dexterity to operate the scooter. Go ahead, experience the Drive difference. Floor to Seat Height: 19.50"-22.50"
White glove service available for $180. Please add special service to cart upon checkout under Allegro ID 576178. Please call 1-800-861-3211 if you require special freight needs.Additional charges may apply.